How fun!!! Wonder who won the race? Hi, and thanks! I'm always surprised by how many pictures exist of me with a dog and how far back they go. This was the first dog I really remember, although we had others. He and I had a lot of fun together. Thanks for visiting and for saying hi. What a great photo! Fritz was such a cutie! Fritz was an awesome dog. Do you remember the time we were having a family picnic at Lincoln Woods? The time a horse on a trail ride came galloping out of the woods headed right for us. Fritz charged off the blanket at the horse. The horse veered, thankfully, away from Fritz and ultimately, us. Such a cool photo:) Fritz looks like he was a wonderful, fun little dog. Great photo Leslie! I knew you had a soft spot in your heart for little terriers! Hi Kristine! Thanks. He was a cute little guy. Smart as the dickens, too. He was a great dog to grow up with. I remember now that you mention it. He was a spunky little thing. I most remember teaching him to give hugs. (Guess that's why I wanted to teach Bella the same.) He could just reach his paws up and around my shoulders. So cute. He was. 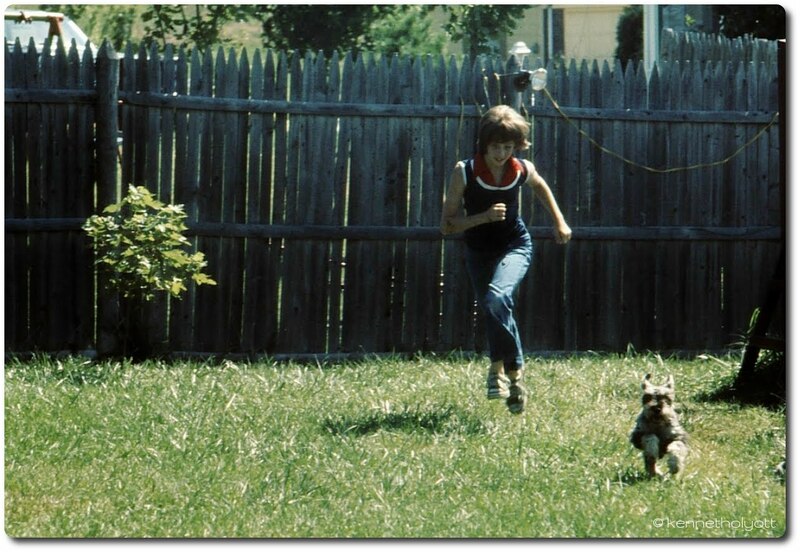 My dad always had a camera in his hand and the dogs and I seemed to be constant subjects. It's a great scrapbook of memories. I also think it gives me an insight into how he literally saw the world. Thinking of it that way, I know now that my dad lived in a beautiful world. Once a dog lover, always a dog lover. What a cute picture. Hi Wyatt's mom! Thanks for stopping by. I have even older pictures of me with our dogs. But I honestly think it's genetic - my dad was awesome with dogs. His grandfather even bred and raised Boston Terriers. Thanks for visiting and saying hi. I'm glad you liked the picture. I hope you'll stop by again sometime.